Gigi Hadid gave the world a glimse of her bridal look and sent the internet into a frenzy of her ‘wifey material’. At Milan fashion week, Gigi dazzled the red carpet showcasing amazing creations from different designers. With a finale catwalk which left the audience in awe. 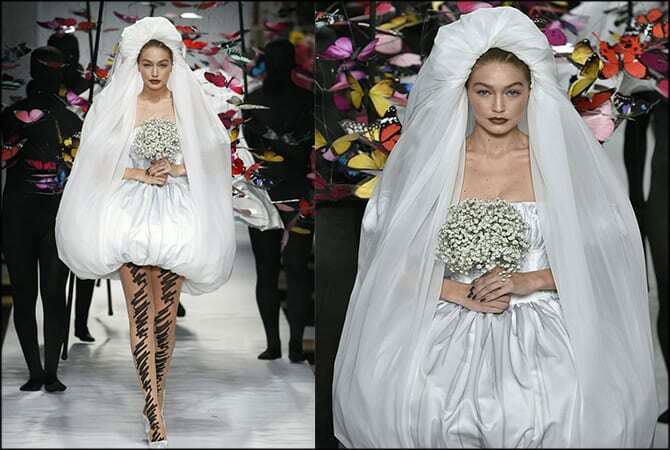 When she closed that show for Designer Jeremy Scott wearing a bridal dress with a surreal wedding veil. The Fashion designer is well known for his collaborations with Moschino and his unique designs have been showcased at Milan Fashion Week by Gigi Hadid. She donned the catwalk with poise and grace as people wearing a completely black body suit carried her veil. Gigi’s sister Bella Hadid could not contain herself and posted magical moments from stage on Instagram. Earlier this year Palestinian Super Model Gigi Hadid and Pakistan heritage Zayn Malik posted pictures online of the two wearing traditional Pakistani clothes in England, during Eid ul Adha celebrations. It is safe to say the couple are happy and content in their relationship with British- Born Singer. During the Milan catwalk Gigi’s sister Bella Hadid couldn’t stop herself from getting a bit emotional as she watched her sister gracing an exquisite wedding dress and causing the internet to meltdown with rumours of an upcoming wedding between the two stars. Gigi Hadid is also a campaigner for human rights. As part of UNICEF’s mission to help Rohingya refugees, Hadid visited the Jamtoli Refugee Camp in Bangladesh, in hopes of raising awareness on the Rohingya refugee crisis.